Bronze, Solid, One Piece Automatic Transmission Bushings and Bushing Kits for USA and Foreign Made Automobiles and Trucks. Omega Machine & Tool has been supplying the automotive transmission industry with one piece, solid bronze bushings for close to twenty years. We manufacture individual bushings, complete bushing kits, tools, and have a variety of different repair operations we do on transmission parts. 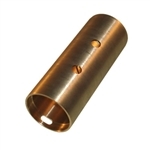 If you need a single bushing or several thousand, we have the capacity to meet your needs. To start the process of making a custom bushing, simply send us any part that interfaces with the bushing. Better yet, give us a call at 916 372 6001 to get the ball rolling, ask for Dennis. We pride ourselves on producing high-quality products. Most O.E.M. bushings, out of necessity, have too much clearance. Omega Machine produces a precision bushing for today's precision transmission. Copyright © Omega Machine & Tool. All Rights Reserved.